Safeguard openings in rated walls, floors, and ceilings against the spread of fire and smoke using the latest requirements in NFPA 80, Standard for Fire Doors and Other Opening Protectives. In a fire event, NFPA 80 compliance can make all the difference in occupant life safety and property protection. That's why NFPA 80 is referenced by NFPA 101®, Life Safety Code®, model building codes, and fire codes nationwide and around the globe. Proper installation of openings in fire rated assemblies is critical -- and fire doors and fire windows are required to be inspected and tested annually to ensure they remain in proper working condition and can help confine a fire should one occur. If you're responsible for building fire safety, there's no substitute for the latest edition of the standard. New definitions for inspection mark and field label help users apply inspection, testing, and maintenance provisions. Updated provisions in Chapter 4 recognize job site preparation of fire doors for fire pins. New provisions in Chapter 4 cover measuring clearance under the bottom of fire doors, and a new requirement addresses bottom clearance with the presence of latching hardware devices. The scope of Chapter 5 is expanded to address fire protective curtain assemblies, and a new section in Chapter 5 addresses inspection marks. While the standard now requires damper manufacturers’ installation and maintenance instructions be maintained on site for new damper installations, updated Chapter 19 also has the latest requirements for the inspection, testing, and maintenance of fire and combination fire/smoke dampers and adds a remote inspection method. New language clarifies application of inspection requirements for single inaccessible dampers. All referenced publications and extracted sections are up-to-date. Interested in other editions of NFPA 80? Use the drop down menu above to select the edition year you need. 4.2 Listed and Labeled Products. 4.3 Classifications and Types of Doors. 4.4 Glazing Material in Fire Doors. 4.5 Fire Resistance–Rated Glazing in Doors and Windows. 4.6 Classification of Hardware for Fire Doors. 4.7 Actuation Devices for Fire Doors, Fire Shutters, and Fire Windows. 6.5 Application, Installation, and Adjustment. 14.3 Hoistway Door Vision Panels. 15.4 Pneumatic Chute Intake Doors. 20.2 Fabric Fire Safety Curtain Components. 20.4 Fire Safety Curtain Assemblies. 20.6 Rigging and Lifting Equipment. 20.7 Operation of the Fire Safety Curtain Assembly. 21.2 Mounting of Fire Protective Curtain Assemblies. 21.6 Inspection, Testing, and Maintenance. 21.9 Periodic Inspection and Testing. Protect openings in rated walls, floors, and ceilings against the spread of fire and smoke with NFPA 80. 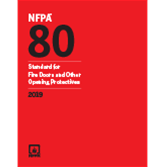 Expanded, revised, and updated, the 2016 edition of NFPA 80, Standard for Fire Doors and Other Opening Protectives helps you ensure proper installation, inspection, testing, and maintenance of fire door assemblies, fire window assemblies, fire dampers, fabric fire safety curtains, and fire protective curtain assemblies. Referenced by NFPA 101®, Life Safety Code®, model building codes, and fire codes, NFPA 80 is vital to the fire protection of openings. Proper installation of openings in fire rated assemblies is critical to both occupant life safety and property protection -- and fire doors and fire windows are required to be inspected and tested annually to ensure they remain in proper working condition and can help confine a fire should it occur. Expanded requirements for fire door labels help Authorities Having Jurisdiction (AHJs) and end users verify that the assembly or product is appropriate. New section for the required marking of fire rated glazing offers better usability by promoting standardized requirements. New chapter on fire protective curtain assemblies addresses new technology. Additional guidance for use of oversized fire doors reflects industry needs. Reorganized requirements for actuation devices for use with fire doors, fire shutters, and fire windows. A new allowance to use specific products on doors exceeding maximum clearance under the bottom of the door explicitly allows a new category of products, where listed for this use.